Palm Sunday marks the beginning of Holy Week, celebrating the Triumphal Entry with the Blessing and Procession of Palms. Hosannas quickly turn to cries of "crucify" with the solemn reading of the Passion Narratives. A small Mass for Monday in Holy Week will be held in the Crypt Chapel, featuring the recitation of the Passion Narrative from Mark 14. A staple feature of Holy Week is the Chrism Mass celebrated by the bishop of the diocese, at which all the clergy of the diocese gather for the yearly blessing of Holy Oils. The Chrism Mass this year will be celebrated at St. Vincent’s Cathedral in Bedford, TX. Bishop William Wantland will be the celebrant and preacher. It’s in the middle of the day and requires travel, but is is wonderful experience and is worth the trip! A small Mass for Tuesday in Holy Week will be held, also in the Crypt Chapel, featuring the recitation of the Passion Narrative from Mark 15. A small Mass for Wednesday in Holy Week will be held, also in the Crypt Chapel, featuring the recitation of the Passion Narrative from Luke 22. The Tenebrae is the ancient, monastic Matins and Lauds offices of Maundy Thursday. At this sober service of psalms and lessons, the faithful are led to meditate on the death of Christ as candles are slowly extinguished one by one throughout the service. Maundy Thursday marks the beginning of the Triduum (The Great Three Days) and celebrates the Institution of the Holy Eucharist, the Washing of the Disciples' Feet (The Maundy), and the Betrayal of Christ in the Garden. The service ends in with the rites of the Stripping of the Altar and the procession to the Altar of Repose. Good Friday commemorates the crucifixion and death of our Lord. The Good Friday liturgy begins with a silent procession and the reading of the Passion Narrative. This is followed by the Solemn Collects, the singing of the Reproaches, and the Veneration of the Holy Cross. Our noon service will be a simple, said service said directly from the prayer book. Our evening service (6pm) will be sung service with all the smells and bells. All are welcome at either. The Great Easter Vigil is the first celebration of Easter. It is a very ancient liturgy that begins with the Lighting of the New Fire, the procession of the Paschal Candle, the reading of the Prophecies, the Blessing of the Baptismal Font with Baptisms, the first Mass of Easter, and the return of the Alleluia! Join us for an unforgettable and joyous celebration. 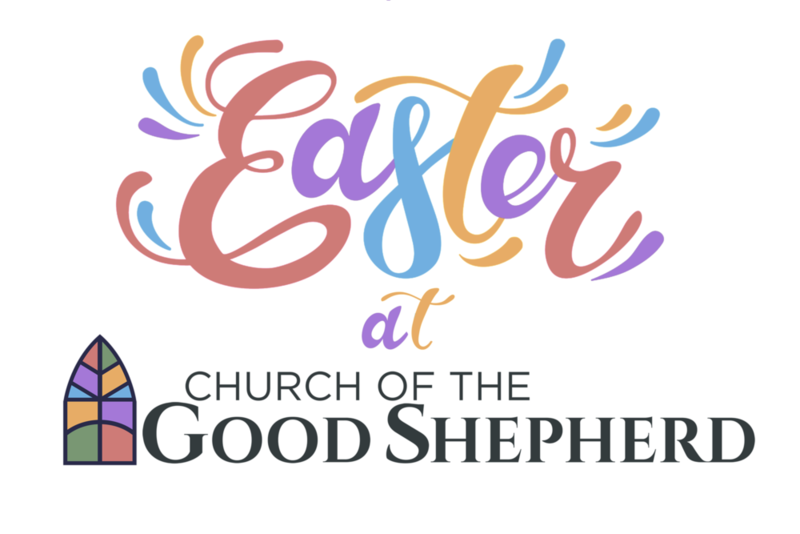 Come celebrate the resurrection with us! Our Easter Sunday morning sung service is beautiful with classic Easter Hymns, the flowering of the cross, and plenty of “Alleluias”! Join us afterwards for an Easter egg hunt, outside if the weather is good or in the Parish Hall otherwise.